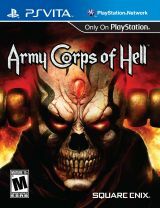 ‘Army Corps Of Hell’ Coming To Playstation Vita February 22nd!!! The new handheld portable video game system, ‘The Playstation Vita’ (Vita is latin for life) will be released February 22nd of this year with one of its launch titles ‘Army Corps of Hell’. The Vita was announced at E3 last year and has already been released in Japan. The system sold over 325,000 units in the first couple of days in Japan and is highly anticipated here in the states. The Vita looks like it will come in two options much like the iPad. One with wi-fi only and the other with 3G and wi-fi. The system will retail between $249-$299 depending on which model. One of the launch titles By Square Enix is called ‘Army Corps of Hell’ and looks to be very promising. The story is literally the King of Hell who loses his battle against the gods and becomes a full on skeleton. He conjures an army of demons and goblins to do his dirty work with one “end game” in mind. Reclaim his throne and destroy anyone who opposes him. Looks pretty good. There are a couple of funny viral videos circling the web for your enjoyment. In these viral videos, The feared King of Hell is searching for his way back to Hell, but soon realizes he is not in Hell but in Michigan, which is as close as it gets. As he interacts with the common folk, he gets angrier by the second that it’s not the hell he is expecting. ‘God of War: Ascension’ Has A Trailer!!! This entry was posted on Monday, January 23rd, 2012 at 1:53 pm	and is filed under News. You can follow any responses to this entry through the RSS 2.0 feed. You can skip to the end and leave a response. Pinging is currently not allowed. « Reese Witherspoon, Ryan Reynolds, and Tim Burton Team Up For ‘Big Eyes’!! !